New Brunswick Minister of Education Roland Hache (right) has refused a request for information about the apparently "top secret" driver education training program that the government has developed despite a Coroner's Jury recommendation for "nothing less" than trained Class 2 yellow school bus drivers behind the wheels of MFAVs. This has led us to ask more questions about the MFAVs themselves and to make sure we get the right answers, we asked the exact same set of questions to both the Minister Hache, and the NB Minister of Transportation, Denis Landry (middle). 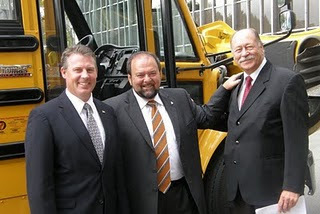 Environment Minister Rick Miles is at left in this photo taken in September 2009. 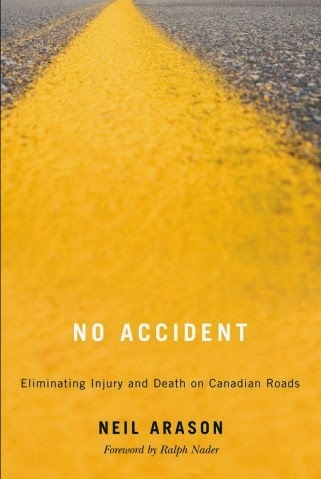 In April we wrote to the New Brunswick Minister of Education, Roland Hache, requesting a meeting with him to discuss the implementation of Recommendation #6 of the Coroners Inquest into the death of our sons. Click here to read our letter to Roland Hache, dated April 15, 2010. We also asked for details on the New Brunswick government sponsored driver training program for volunteers who offered to drive the 21 and 24 passenger Multi Function Activity Vehicles. We received a response from the Minister on May 14 telling us in no uncertain terms that he didn't think he had to discuss the Coroners Inquest recommendation and that if we wanted to know anything about the volunteer driver training program, we'd have to make a Right To Information Request. Click here to read Minister Hache's response dated May 14, 2010. 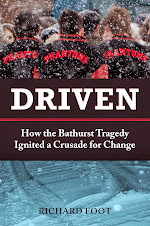 That lead us to believe that there is more to the volunteer MFAV driving program than meets the eye, so we decided to make two separate requests, one about the MFAVs specifically which you can read below, and one about the Volunteer MFAV Driver Education program, which you can read by clicking on the following link. We sent the same letter to the Transportation Minister, Denis Landry, just in case some of the questions cross over into his department. What we have learned about Right to Information Requests is that if you don't ask the right question to the right person, it doesn't get answered. I am writing under the Right to Information Act to request answers to the following questions about the Multi Function Activity Vehicles (MFAVs) operated by the province of New Brunswick for transporting students to extra-curricular and co-curricular events in the 2009-2010 school year. I am also sending this same letter to the Minister of Transportation, Denis Landry in case there are some questions, which cross over into his department. 1. In total, how many 21 passenger and 24 passenger Multi Function Activity Vehicles were operated by the province for use by the Anglophone and Francophone school districts in the New Brunswick Department of Education during the 2009-2010 school year? 2. Which Anglophone and Francophone school districts had MFAVs in 2009-2010 and how many MFAVS did each school district have? 3. Using the two Bathurst High School MFAVs as an example, can and does the Bathurst High School loan its two MFAVs to other schools in the district, or are the two MFAVs exclusive to Bathurst High School students only? In other words, can other schools in the district that do not have MFAVs of their own borrow the vehicles to transport students to extra-curricular and co-curricular events or do they have to find alternative means of transporting students to extra-curricular and co-curricular events? Further to this are the MFAV’s loan to other organizations. Is there a fee for the loan of the MFAV’s? Example Church groups or Non-profit organizations. 4. In the Anglophone and Francophone school districts which had MFAVs in 2009-2010, were there times over the course of the school year when the school districts had to employ alternative means of transporting students to extra-curricular and co-curricular events (for example, did they hire a Class 2 unionized yellow school bus driver to drive a yellow school bus or a bus with more than 24 seat capacity)? 5. If the answer to #4 above is "yes, there were times when the school districts had to employ alternative means", what were these alternative means of transporting students to extra-curricular and co-curricular events and how many times did this occur in 2009-2010, broken down by Anglophone and francophone school districts? 6. Further to question #5, if the answer to #4 is "yes, there were times when the school districts had to employ alternative means", how many times did Anglophone and Francophone school districts which had MFAVs employ Class 2, unionized yellow school bus drivers to drive yellow school buses or buses with more than 24 seat capacity to transport students to extra-curricular and co-curricular events? 7. In the Anglophone and Francophone school districts which had MFAVs in 2009-2010, but which had to use alternative means of transporting students to extra-curricular and co-curricular events, please identify the sources of funding to pay for the alternative transportation costs, for example, at the Department of Education, at the School District level, the school level and / or student councils? 8. In the Anglophone and Francophone school districts which had MFAVs in 2009-2010, but which had to use alternative means of transporting students to extra-curricular and co-curricular events, was there a budget set aside at a) the Department of Education, b) at the school district level, c) at the individual school level, d) at the student councils or e) all of the above to pay for transporting students to extra-curricular and co-curricular events? 9. If the answer to the above is "yes, there was a budget set aside at a) the Department of Education, b) at the school district level, c) at the individual school level, d) at the student councils or e) all of the above", what was the total amount set aside in the budget and how much of it was used to pay for alternative means of transporting students to extra-curricular and co-curricular events, broken down by Anglophone and Francophone school districts. 10. In all the Anglophone and Francophone school districts which operate MFAVs, what schools actually used the MFAVs in 2009-2010 and how many trips did they make in total transporting students to extra-curricular and co-curricular events? 11. In the Anglophone and Francophone school districts which operated MFAVs, how many trips were considered "short" trips and how many were considered 'long trips" ie. over 160 kilometres. 12. What is the total mileage of all the trips made by MFAVs in all the Anglophone and Francophone school districts during the school year 2009-2010. 13. Which Anglophone and Francophone school districts didn’t have MFAVs in 2009-10? 14. In the Anglophone and Francophone school districts, which did not have MFAVs in 2009-2010, what alternative means of transportation did the Anglophone and Francophone school districts use to transport students to extra-curricular and co-curricular events? 15. In the Anglophone and Francophone school districts, which did not have MFAVs in 2009-2010, please identify the sources of funding used to pay for alternative means of transporting students to extra-curricular and co-curricular events? 16. In the Anglophone and Francophone school districts which did not have MFAVs in 2009-2010, was there a budget set aside at, a) the Department of Education, b) at the school district level, c) at the individual school level, d) at the student councils or e) all of the above for transporting students to extra-curricular and co-curricular events? co-curricular events, broken down by Anglophone and Francophone school districts. 18. How much was spent by Student Councils to pay for alternative means of transporting students to extra-curricular and co-curricular events in 2009-2010? 19. How much was sent by Student Councils for the maintenance, repair and purchase of MFAVs in 2009-2010? 20. What is the total operating budget for the provincial fleet of MFAVs used by the Anglophone and Francophone school districts? 21. Finally how many MFAV’s were operated by all school districts prior to January 12, 2008. Which school districts and schools. Thank you very much for your attention to this letter and I hope to hear from you soon regarding this Right to Information request. I am also sending this same letter to the Minister of Education, Roland Hache, in case there are some questions, which cross over into his department. transporting students to extra-curricular and co-curricular events? Further to this are the MFAV’s loan to other organizations. Is there a fee for the loan of the MFAV’s? Example Church groups or Non- profit organizations. 13. Which Anglophone and Francophone school districts did not have MFAVs in 2009-2010? 16. In the Anglophone and Francophone school districts, which did not have MFAVs in 2009-2010, was there a budget set aside at. a) the Department of Education, b) at the school district level, c) at the individual school level, d) at the student councils or e) all of the above for transporting students to extra-curricular and co-curricular events?